The high viscosity of certain polymers sometimes prevents polymerization in the concentrated phase. In these cases, the monomers must be polymerized with a large excess of suitable solvents. Following the solution polymerization process step the low viscous polymer-solvent solution is typically pre-concentrated by flash evaporation. The solid content, to which the solution can be concentrated to, is limited by the flow ability of the viscous solution in the flash vessel. To be able to reach higher solid concentrations the LIST KneaderReactor is the ideal and most economical technology. It allows concentrating the solution up to a solid content of 90 – 95 %. This process is easily scalable since the heat energy needed to evaporate the solvent is mainly provided by the mechanical kneading energy. The foam generated by evaporating the low viscous polymer solution is effectively eliminated by the viscous polymer mass. Moreover, the LIST KneaderReactor allows an accurate control of the product temperature. This prevents the formation of crumbles at lower product temperatures or thermal degradation at higher product temperatures. 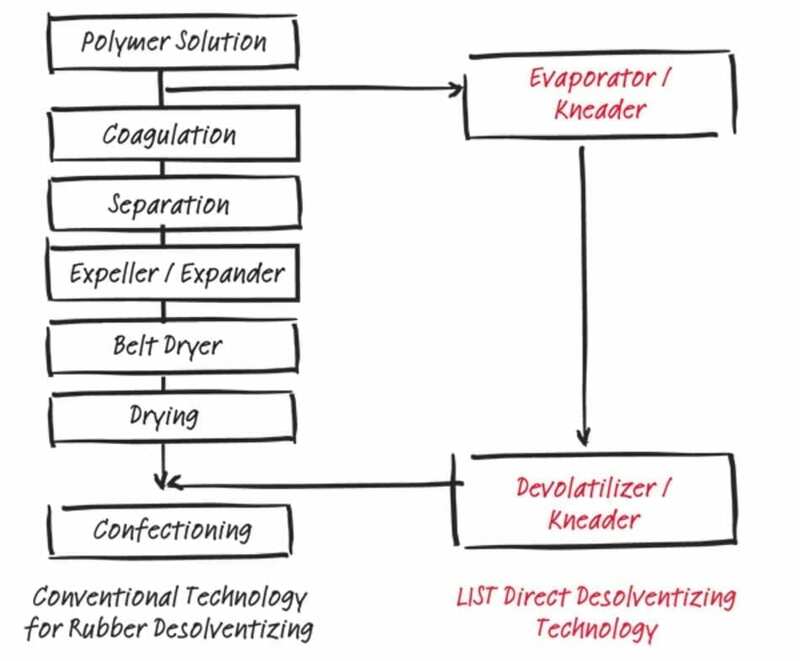 The subsequent process step where the Polymer is finished to its final quality is the devolatilization.